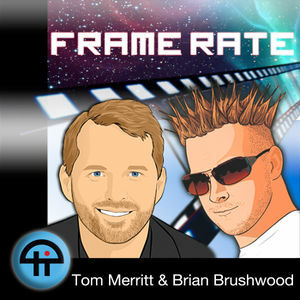 Frame Rate was a podcast in which Tom Merritt and Brian Brushwood discuss films, TV, and anything else of related interest. Brian has described Frame Rate as "The show about cord-cutting, hosted by two guys who really like the idea of cutting the cord, but haven't gotten around to it." Since Tom left the TWiT network in late 2013, Frame Rate ended in January 2014. It has been succeeded by Cordkillers. Originally running as a series of tests going as far back as June 8, 2010, the show eventually went from alpha to beta to golden master with the premiere episode airing on November 9, 2010. The show aired live on the TWiT Network Mondays at 6:00 pm ET (3:00 pm PT). Each Segment had an opening bumper video made by a member of the Chatrealm. This page was last modified on 17 January 2018, at 19:21.